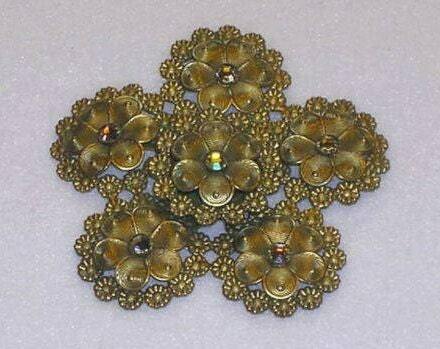 Vintage signed Hattie Carnegie Brooch Pin. It was probably first designed to be added to a fur coat. It measures a large and impressive 3.20 inches in diameter. Lacy floral design with 6 large flowers surrounded by rings of smaller flowers. The larger flowers have glittering clear crystals set into the centers. The metalwork on this piece is amazing. The setting is an antiqued gold over brass. 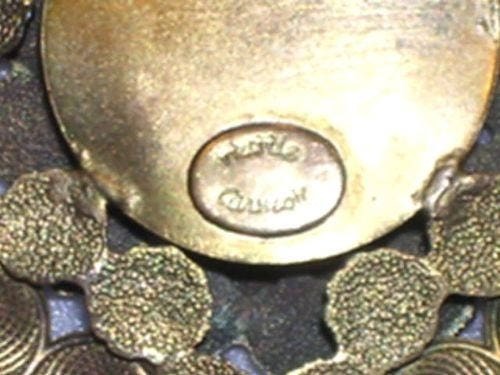 The pin is signed "Hattie Carnegie" in script on an oval cartouche on the back. Excellent Condition. A must-have for any vintage costume jewelry connoisseur. More about Hattie: While it’s believed Carnegie produced jewelry to complement her clothing, particularly her trademark “little Carnegie suits,” her official line of marked jewelry did not hit the market until 1939. 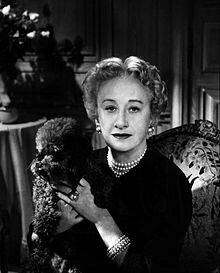 Like Chanel and Elsa Schiaparelli, Carnegie flourished in the “cocktail jewelry” movement (1935-1960).